FILE - A view of the Western Wall and the Dome of the Rock, some of the holiest sites for for Jews and Muslims, is seen in Jerusalem's Old City, Dec. 6, 2017. What has US President Donald Trump done with respect to Israel? Donald Trump has decided to recognize Jerusalem as the capital of Israel, the first U.S. President to do so since Israel was founded in 1948. Tel Aviv is currently home to the U.S. Embassy and many foreign embassies. Trump plans to eventually move the U.S. embassy to Jerusalem, but relocation could take up to two years. U.S. law requires the president to sign a waiver every six months that leaves the embassy in Tel Aviv. This week Trump missed the latest six-month deadline, but U.S. officials say he will sign the waiver and also order the State Department to begin the relocation process. Why has Trump recognized Jerusalem? Trump is fulfilling a campaign promise to move the U.S. embassy in Israel to Jerusalem. He adopted a strong pro-Israel position as a candidate that appealed to his large evangelical base and pro-Israel American Jews. Trump's promise was very popular with those two segments of his supporters, including casino tycoon Sheldon Adelson, who donated $25 million to a political action committee that supported Trump during his campaign. U.S. administration officials say the recognition of Jerusalem acknowledges "the historical and current reality" of Jerusalem. 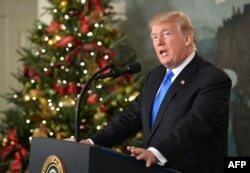 U.S. President Donald Trump delivers a statement on Jerusalem from the Diplomatic Reception Room of the White House in Washington, Dec. 6, 2017. ​Why is Jerusalem, long the source of intense contention, so significant? Israelis and Palestinians have made claims over Jerusalem, the seat of Israel's government. Israel claims all of Jerusalem as its capital while the Palestinians see the city's eastern sector, captured by Israel in the 1967 Mideast war, as the capital of a future Palestinian state. The conflict is focused on Jerusalem's Old City, which is home to Islam's third most holy mosque and Judaism's holiest site and the reasons the city has been a contentious issue for Jews and Muslims throughout the world. Although Israel controls the city, its annexation of east Jerusalem is not recognized by the global community, which wants the decades-long conflict to be settled at the negotiating table. Jerusalem is also home to the Church of the Holy Sepulchre, which was built where many Christians believe Jesus was crucified and buried. The Armenian and Roman Catholic denominations and the Greek Orthodox share custody of the church, where tensions frequently escalate over control of its various quarters. What has been the reaction to Trump's decision? Palestinians have reacted angrily to the Trump decision, warning that it would disrupt, if not end, U.S.-sponsored negotiations aimed at resolving the Israeli-Palestinian conflict and creating a Palestinian state next to Israel. The decision is being applauded by Israel, whose prime minister, Benjamin Netanyahu, is one of Trump's most fervent international supporters. Leaders of the largest Christian denominations in Jerusalem have urged Trump to reconsider his decision. They said in a letter to Trump that his decision will result in "increased hatred, conflict, violence and suffering in Jerusalem and the Holy Land." The letter was signed by all of Jerusalem's major church leaders, including the Greek Orthodox patriarch and the Roman Catholic apostolic administrator. 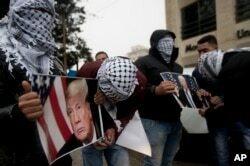 Palestinians holds posters of the U.S. President Donald Trump during a protest in the West Bank City of Ramallah, Dec. 6, 2017. ​What are the potential ramifications? Trump's move overturns nearly seven decades of foreign policy and analysts warn it could threaten efforts to broker a peace deal between the Israelis and the Palestinians. Arab leaders warn it could elicit new outbreaks of violence, prompting the White House to prepare by coordinating plans to protect Americans abroad. Israeli security officials say they are prepared for all scenarios. In addition to angering key allies in the in the Arab world, the move threatens to infuriate allies in the West. The Israelis and the Palestinians maintain a discrete security relationship in the West Bank that has helped prevent an escalation in violence in recent years. But much of the violence in Jerusalem and the West Bank has been linked to tensions in the Holy City. Jerusalem is a largely open city, but a nearly decade-old Israeli separation barrier cuts through several Arab communities and requires tens of thousands of Palestinians to pass through crowded checkpoints to reach the city's center. Deadly riots broke out in Jerusalem in 1996 after Israel opened a new tunnel in the Old City. A second Palestinian eruption occurred in 2000 after then-opposition leader Ariel Sharon visited the Temple Mount, which has been revered as a holy site for thousands of years by Judaism, Islam and Christianity. The city experienced a string of Palestinian stabbings in late 2015, partially due to an increase in the number of Jewish nationalist visitors to the Temple Mount. Last summer, Jerusalem experienced weeks of unrest when Israel attempted to install security cameras next to the Al-Aqsa Mosque after a Palestinian's fatal shooting of two Israeli police officers.